SMTP and POP3 are two of the most important technical aspects of the whole process of email dispatch and delivery. To put it simply, SMTP (acronym for Simple Mail Transfer Protocol) handles the delivery, while POP (acronym for Post Office Protocol) takes care of the email retrieval and download. (Another very popular protocol that you can use in place of POP is IMAP – that is, Internet Message Access Protocol). The name POP3 is simply referred to the protocol’s latest version, officially released in 1996. In 2003 there’s been an informal proposal for a new specification, POP4: but no news has come since that day. So the normal journey of an email is more or less like the journey of a paper mail through different post offices: you send a message using a client (Apple Mail, Mozilla Thunderbird, etc. 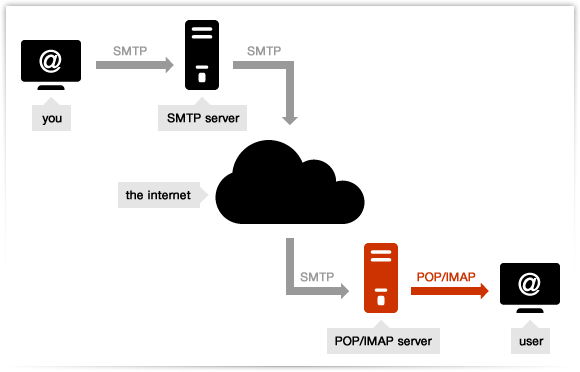 ), it connects with a server via SMTP protocol and delivers the email: finally, the recipient’s client uses POP3 or IMAP to retrieve it. To set up a mail client it’s thus necessary to enter the correct POP and SMTP specifications. However, remember that using a free SMTP like the one associated to a common provider can raise some issues in terms of correct email delivery. Free providers also set some strict limitations in terms of how many messages you can send (per hour or per day), preventing you to mail out a bulk message. So if you’re setting up an email campaign it’s better to rely on a professional SMTP server like turboSMTP, in order to ensure the highest deliverability.